It can't be easy to take a fairy tale that's not only iconic and filled with familiar archetypes but whose entire premise is wrapped up in a magical transformation, the familiar moth to butterfly trope, and breathe new life into it. While in the mind of a child, it's both wonderfully simple and simply wonderful, to turn a few mice into a team of white horses; a pumpkin into a glorious golden carriage; an ordinary girl wearing the same old dress into a beautiful princess, pulling that feat off in real life has, up to now, been an impossibility. But now, director Kenneth Branagh, in a happy marriage of technology and imagination has made the magic happen. If Disney's 1950's animated version of the beloved story of Cinderella has lived happily alongside a child's imagination, this version fleshes it out in fantastic visual fashion. This newest incarnation takes Charles Perrault's fairy tale and tweaks, ever so slightly mind you, the conceit that the prince saves the girl—after she gets a magical make-over—from her horrid life where she would otherwise be doomed to cook and clean and be everyone's doormat forever. You know the magic words by heart: And they lived happily ever after. The change, which I fear, is not large enough, goes something like this; IF you are very good, and kind and courageous, AND you get the chance to meet a handsome prince in a forest—or, I suppose, in your real world Starbucks or on the subway or the park across the street—AND you get a magical make-over AND you have an impossibly tiny waist, then your prince will recognize your kindness and courage as the kind of stuff he wants in a partner, THEN he will rescue you, saving you from our horrid life where you would otherwise be doomed to cook and clean and be everyone's doormat forever. What about his horrid life without the right woman as his partner? 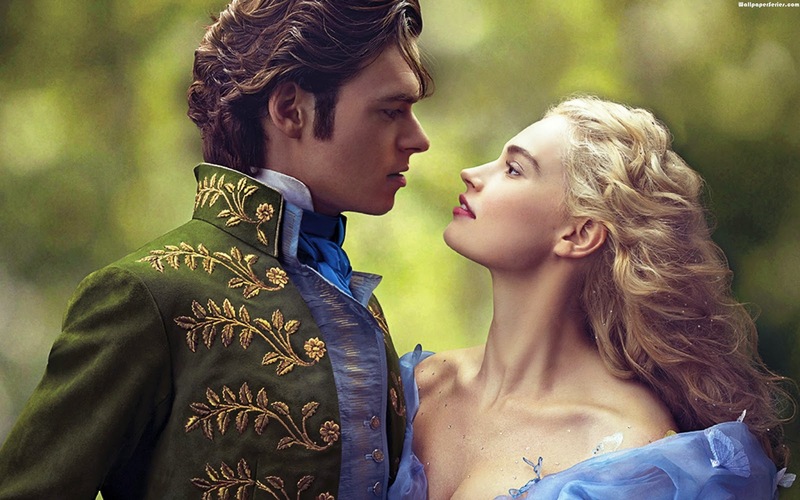 Without Cinderella (Lily James), Prince Charming (Richard Madden) might not be as happy, but he would still be a prince, with the castle and mega ballroom and attendants and regal accoutrements while without Prince Charming, Cinderella would still be Cinderella, doomed to cook, and clean and be everyone's doormat forever. There's something wrong with that, that in 2015; girls and women, are still seen as being saved by a man. We're still the ones that keep the home fires burning while men go off and do great things. We're still the ones singing the same old song. In the words of Billie Holiday "Someday he'll come along, the man I love. And he'll be big and strong, the man I love." We need more examples of women who do great things, whose marriage, while wonderful, is as incidental to their great achievements, as marriage seems to be to men. That being said, I found myself being swept up by the ravishing-looking fantasy of this very familiar fairy tale. Sweeping my inner feminist's fears away, rocking my romantic side, I found a good deal to enjoy about the age old boy meets girl story. I'm old enough to know 'happily ever after' are just three little words; my ten year old self would have dreamt about escaping into a life filled with what I thought love was. Romantic and breath-taking, the magic of a first kiss, day after day. And after that lengthy preamble, here's five things I loved, followed by five things that bothered me. Everything about her. 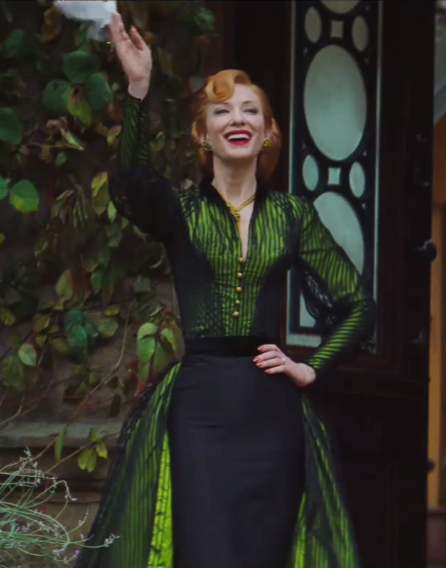 From Blanchett's nuanced but wonderfully wicked performance as the step-mother to her green-with-envy costumes by Sandy Powell. Blanchett isn't just evil; when Cinderella's father goes away for the first time, it's clear that it's his daughter, Cinderella, not his new bride that he's bereft at leaving. Blanchett manages a look that tells us, no matter how bitchy, she's still capable of being hurt by his indifference. 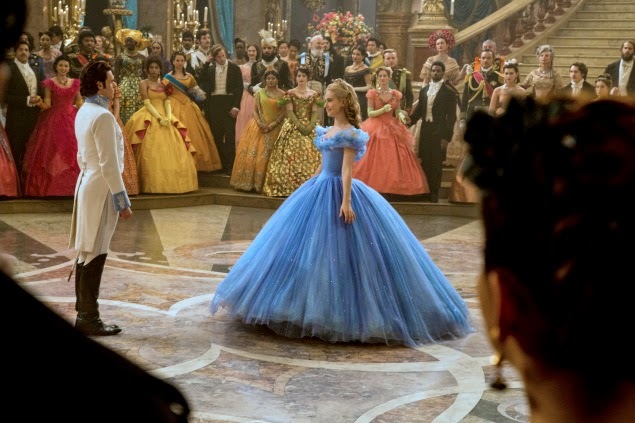 There's probably only one blue dress in the world that's more famous than Cinderella's and we're not going to talk about that here! Every little girl wants her blue dress for their Halloween costume; the one Lily James wears here will be equally coveted by their older sisters. Costume Designer Sandy Powell will no doubt get another Oscar nomination for her work here, from the blue dress that reportedly took 500 hours to complete—at union wages, we hope rather than being sewn by hand by slave labor in India or Pakistan—to Cate Blanchett's 1940's screen siren-inspired ensembles to the silly and outlandish styles Cinderella's step-sisters, Drisella (Sophie McShera) and Anastasia (Holiday Grainger) wore. The sets by the husband and wife team of production designer Dante Ferreti and set decorator Francesca Lo Schiavo were drop-dead gorgeous. 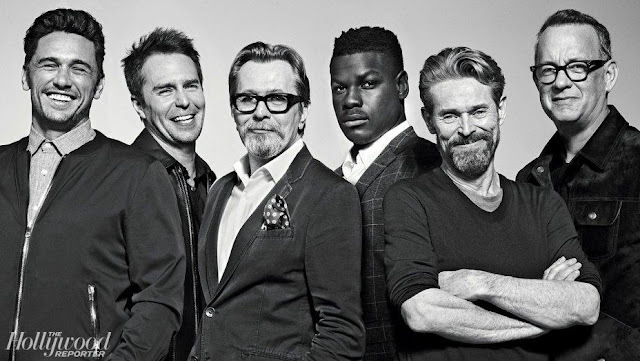 Director Kenneth Branagh had the sense and senility to hire the best; the pair have worked together for thirty years, been nominated for their work eight times, won three Oscars—for Hugo, The Aviator and Sweeney Todd—and will no doubt be nominated for Cinderella. Equal to any fantasy the ballroom set was built in the 'OO7' soundstage at Pinewood Studios and boasts 5000 oil lamps which had to be lit by hand and 17 chandeliers custom-made in Venice. I'd love to hear that the chandeliers, instead of going into a giant studio warehouse to gather dust, are being auctioned off, with the proceeds going to charity. 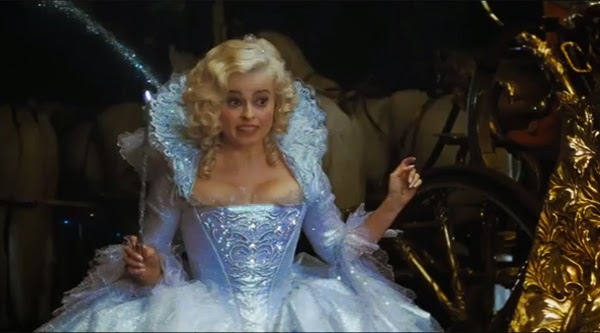 HBC has very little screen time but almost steals the show with her wry humorous take on the fairy godmother role. The very first act of magic she undertakes is to transform herself from cackling old beggar woman to her rather spectacular self. "There, that's better!" she says and one can't help but agree. Hell, yes! If I could be a fairy godmother, why wouldn't I make sure I looked drop dead gorgeous too? 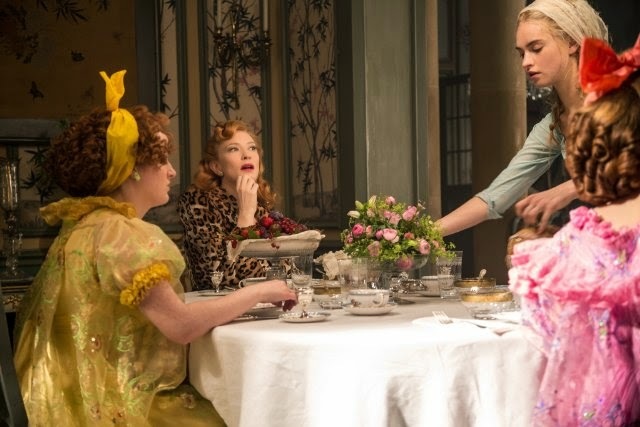 The whole approach to Cinderella's transformation is spot on, with HBC melding a combination of barely suppressed sarcasm, the best intentions and just a touch of reckless experimentation. When Cinderella tells her she wants to go to the ball in her mother's old dress which she's refashioned herself, HBC's fairy godmother humors her, but nonetheless whips the ordinary pretty, pink dress into the dazzling blue creation that has nothing in common with Cinderella's old dress, imbuing it with teeny lights and tiny butterflies at the shoulders. 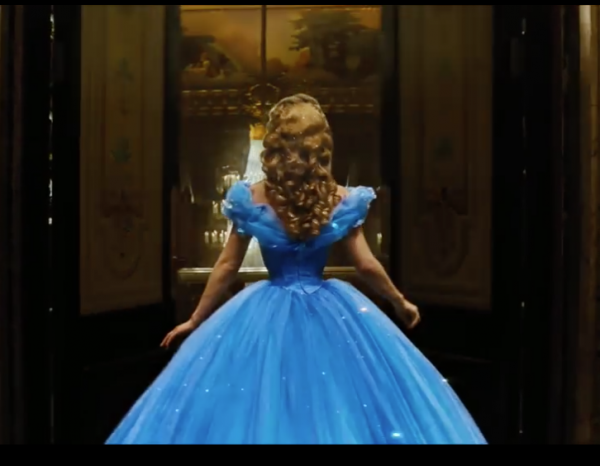 Is Cinderella disappointed her new dress looks nothing like mom's? Nope! And who can blame her? And as beautiful as that transformation is, it's nothing compared to the CGI magic of making a golden carriage out of a pumpkin, mice into horses and lizards into footmen. In my favorite sequence in the film, when the fairy godmother waves her magic wand over the pumpkin—inside a greenhouse, as are HBC and Cinderella—the pumpkin begins to expand, popping out the windows and finally getting so huge, that it bursts free of its walls, pushing the women out too. Seeing the cute little round ears of the mice pop out into horse's ears is nothing short of phenomenal, as is their return to themselves at the stroke of midnight. I couldn't take my eyes off the oh-so-charming little critters. I'll be honest here; while Nonso Anozie was fantastic as the Captain of the Royal guard, the only person who seemed to really care about the prince's best interests, playing the part with humor and dignity, it may not be pc to say but I liked him in part because he was a big, beautiful black man with a beautiful English accent. Kudos to director Branagh for giving us a fairy tale world that's a least a little bit more diversely hued than what we've seen in the past. Would a black man have held such a high position in the royal court? Who cares? This is fantasy, where pumpkins become coaches and mice become horses. More importantly, we have got to start giving children of color people they can recognize when they go to the movies. Today, the Captain of the Guard, tomorrow Prince Charming. Men are fantastic, so is marriage. I love my husband, but he's no Prince Charming. Modern women, young and old, know that love and marriage aren't everything, and shouldn't be. The only way to save yourself from your dull, dreary life is to do it yourself. See paragraphs one and two. When Cinderella's father remarries and has to go away on yet another business trip, Cinderella is distraught and runs after him declaring her love. I can relate because I grew up with a father who was always going off on month and two month long business trips BUT Cinderella, while saddled with a truly wicked stepmother, really needs to grow a pair. 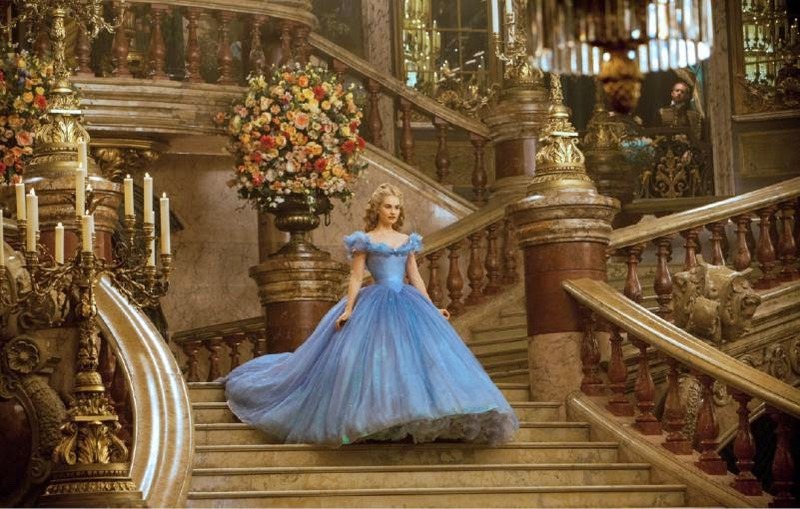 She's not a little girl anymore, she's a young woman, so WoMAN up Cinderella. And you know what? IF I were newly married to this man and he spent more time blowing kisses to his teenage daughter than me, I might be a little pissy too. The scenes of Cinderella chasing after daddy had me less inclined to feel sorry for her, than I was sorry for the wicked step-mother. Why are we still selling this fantasy? In our modern age when so many marriages end in divorce, we have more so-called step-mothers and fathers than ever. Don't get me wrong, Cate Blanchett was fantastic, dripping with disdain and her dead-pan delivery of "Call me madam" was dead-on and hilarious when seen through the eyes of adults. BUT what message are we sending kids? This movie is for kids, right? Because if it's not, what the hell are we doing, making fairy tales for grownups?Anyway, don't second marriages and blended families have enough difficulties to overcome than our culture encouraging the continuation of the wicked step-mother stereotype? It's only a movie? Movies and television shows are our mirrors, they reflect our world, they need to do so with accuracy and understanding. By that I mean, with herself. I was mystified that after being raised in such a loving family Cinderella had so little self-esteem and personal strength that she immediately buckled under some cruel sniping and that she obeyed her bossy step-sisters. Just say NO! 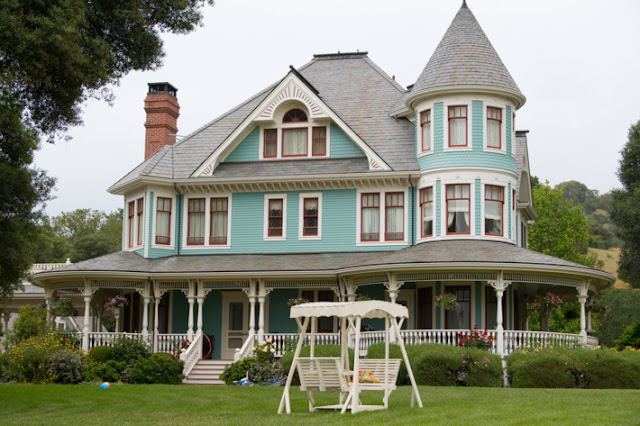 Cinderella, or better yet, when step-mom dismisses the staff and one of the housemaids offers you a roof, go for it. Instead she stays and subjects herself to verbal abuse. Quite hilariously, she's surprised again and again when she's treated shabbily. Really, Cinderella? And what were you expecting? There's plenty of controversy about Lily James ridiculously tiny waist in that blue dress. And rightly so. 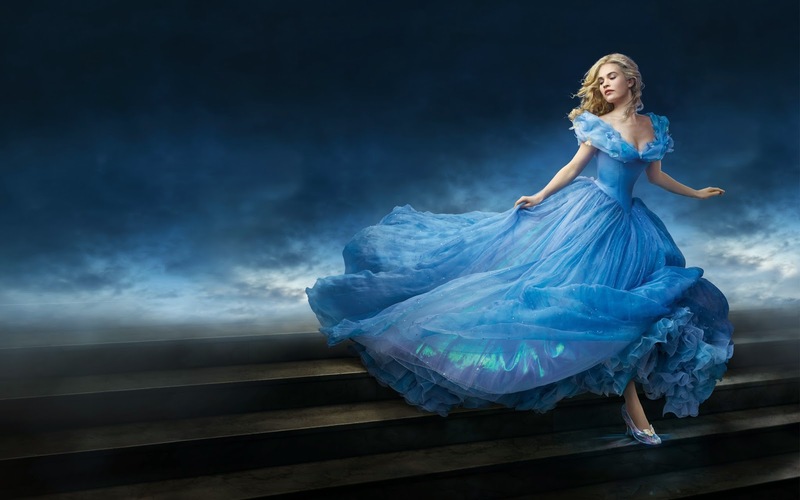 While Disney and Kenneth Branagh deny digitizing the dress to achieve the impossibly small waist, and James herself—who went on a liquid diet to fit into the corseted dress—calls the controversy boring, saying that children care more about Cinderella's morals than how she looks; the body image presented is nonetheless unrealistic and sets up unrealistic expectations girls and young women have for themselves. I know I'm being a stick in the mud but for any woman who has ever had body issues, standards like these are not helpful. Instead of stuffing James into a corset —or digitizing her waist—what the world needs now is a Cinderella, with a normal size waist, that all young women can recognize in themselves.